THE role of the chief financial officer has grown over the years beyond simply keeping books in order and crunching numbers to working with top management to chart a company's strategy. The global financial crisis and the changes it brought, such as tighter regulations and increasing market volatility, have transformed the position into a crucial one of business leadership. With increasing globalisation, CFOs need to be able to astutely translate global trends into a robust roadmap while keeping risks contained. Today's CFO is at the forefront of decision-making. As Spiderman's Uncle Ben once said: "With great power comes great responsibility." The best CFOs this year, honoured in the Singapore Corporate Awards, tell The Business Times how they rise to the challenge. Question: How did you end up a CFO? Mr Lang: In the list of careers I saw myself in, the CFO role was never on it. So it is really divine intervention that I am in this role today. In my previous job as a banker, I would occasionally get calls from a headhunter who would offer me opportunities at other competitors. "Let's not waste each other's time," I told her each time, as I was happy where I was. In May 2011, this headhunter contacted me and excitedly enticed me with a CFO role for a Singapore-listed company. I told her: "Why would I ever consider a CFO role? I am not even accounting trained. There are only two companies in Singapore where I would be keen to explore being the CFO, and I know both these CFOs aren't going anywhere." I proceeded to tell her that one of the two companies was CapitaLand. When she told me it was indeed for the CFO role at CapitaLand, I almost fell off my chair. After several rounds of interviews, I was offered the job. I was very nervous about making the move as I had been at the investment bank for almost 16 years and had a hand in hiring all but two of the people in my department. I had to go to the Maldives to think through the decision carefully. My wife finally convinced me that it was a no-brainer decision that I should go for. It has now been four years since I made that move, and I have never looked back. Mr Chan: Throughout my career, I've always had a strong affinity for accounting and finance-related work. I have had the opportunity to take on a varied scope of finance work and see the company's operations at different levels. These experiences have enabled me to better appreciate how each business decision should be undertaken judiciously with value creation and risk management as underlying principles. All these eventually culminated in my appointment as Midas' CFO. Mr Yau: Having accumulated 12 years of experience in banking, I had a good background in finance before I was given the opportunity at Megachem to use my knowledge and skills in a different environment. Q: What are the challenges of being a CFO in your field specifically? Mr Lang: Inherently, real estate has three characteristics. First, it is an industry with long gestation periods - which means when CapitaLand buys a piece of land, it's going to be a few years later before it can generate income from that property since it takes time to get the approvals to develop the project. Second, real estate is a cyclical industry. Third, it is capital-intensive - projects are getting very large and ticket sizes get commensurately bigger. Given such unique traits, it is important to be able to make long-term decisions while managing the short-term expectations of stakeholders. This underscores the importance of a CFO as the communication bridge between the company and its investors. It is really about keeping things clear and simple - say what you mean, and mean what you say. Mr Chan: Midas operates in a relatively specialised sub-sector of the transportation industry, with products being supplied to many international markets. This creates a need for us to ensure that the necessary due diligence and risk assessments are in place. Accordingly, in our financial reporting, there is an added responsibility to ensure that our business activities and financial management can be clearly understood and appreciated by all stakeholders. Mr Yau: The specialty chemicals industry and our business have seen a rapid pace of globalisation and greater complexities. As such, challenges have surfaced in developing a global integrated business model that is both resilient to the current environment and adaptable to future ones. Q: How is the CFO role evolving? Mr Lang: It has changed from someone who is a steward of the company's financials to someone who can also position the company's capital and funding structure for future growth. A CFO no longer just keeps the books. He or she also needs to be an effective communicator to internal board members, external capital providers and regulators. There is always the tendency to label finance people as "cost centres" or "non-revenue generating". I always get irritated by those comments as the right finance person can play a meaningful role to drive returns for the company. He may not be in the front-line job generating revenue but he can certainly think of ways to drive unnecessary costs down and maximise profits. The finance person also has good insight into the financial health of the company and is able to tell how the company will perform in the coming quarters. Although the traditional role of the finance person is key, it is also important for the finance person to consider how with our limited resources, we can generate a higher return. A CFO can't just count the beans; he has to make sure that some of these beans grow into plants that produce even more beans! Mr Chan: The CFO role is now more strategic, in addition to its regular financial responsibilities as a financial controller. It now involves setting strategic performance goals, integration and analysis of financial and non-financial data, and project management to execute the company's strategy. Another additional role is that of a communicator, both within the organisation and externally. 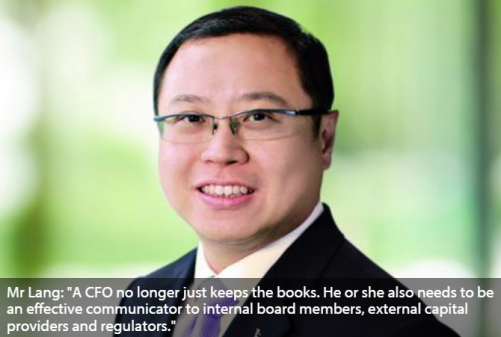 Mr Yau: CFOs need to ensure that their organisations comply with a more complex regulatory environment such as ever-changing reporting standards and mounting pressures to fulfil environmental and social responsibilities across geographies. With advancements in technology as well as the increasing pace of innovation shaping new business models, CFOs should also collaborate closely with IT partners and equip themselves with the knowledge of how the organisation can harness IT to build stronger infrastructures to support its business growth. Q: What can a CFO do to be more involved in the company's business strategy? Mr Lang: The CFO needs to get out of his or her comfort zone. Build a solid understanding of the business, which provides the fundamentals for sound and robust financial decisions. Only by diving into the deep end and getting your hands dirty will you appreciate on-the-ground issues, and only then will the numbers come alive and give you greater appreciation of the financials. Mr Chan: A CFO should leverage on his or her finance experience to distil down in simple terms the implications of certain business decisions and seek new ideas on how things could be better done. Developing commercial insight by venturing into other areas outside finance would help keep the CFO abreast of issues facing the organisation at large, not only finance-related challenges. Mr Yau: A CFO should take it upon himself or herself to seize every opportunity to learn, grow and add value to the organisation while leveraging on the full potential of his or her enhanced status to become a leader of broader strategic changes. Q: What are your views on integrated reporting? Mr Lang: Integrated reporting should not be seen as an end in itself but a long journey to help stakeholders understand the role a company plays in society at large. As companies start on integrated reporting, there will be aspects about their businesses which they will discover and hence modify. So this is definitely the right thing to do but the time taken to implement it has to be calibrated. Also, companies may take different lengths of time to implement this as they are in different industries that face various challenges. I hope the regulators will bear this in mind. This should not be seen as a "check-the-box" exercise to say that Singapore companies have implemented integrated reporting by a certain time but rather a critical tool to ensure that a company exists to benefit many, not just the shareholders. Mr Chan: Integrated reporting is a step in the right direction towards making corporate reporting more holistic and towards providing a more meaningful view of the organisation's business strategy and its ability to create value. It provides, to a certain extent, clarity in the connectivity in the information contained in the annual report. However, because it incorporates both financial and non-financial information, which might already be disclosed in either the annual or sustainability report, the issue of duplication might arise. The framework is very much principles-based and we need to strike a balance between providing flexibility through the principles-based approach and introducing more prescription to allow comparability between peer corporate reports. The cost of implementation has to be considered as well - not just in terms of the costs of training needed to prepare such reports, but in the longer run, also more costs for organisations if an assurance model is to be adopted for these reports. Mr Yau: Implementing integrated reporting is in line with the elevated responsibilities that come with being a listed company. Shareholders have the right to gain access to in-depth knowledge of the company they invest in.